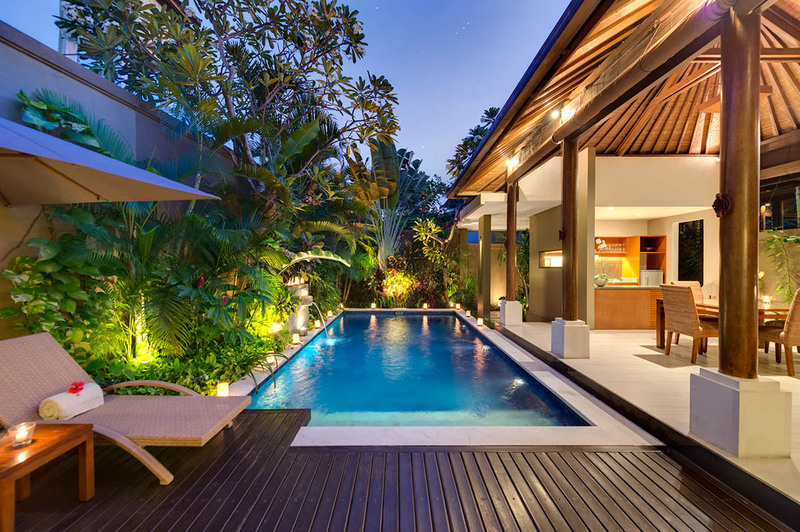 From $ 437AUD per night We have direct contracts with most villa owners. We don't add any booking fees. We are 100% transparent with no nasty surprises. 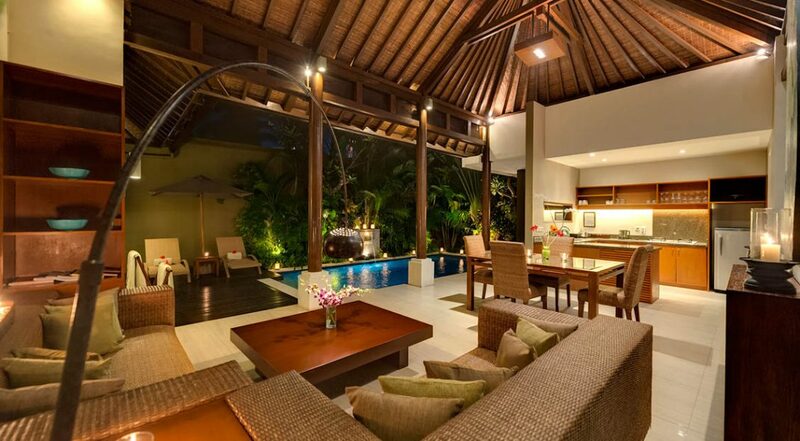 Couples holiday villa in Seminyak - rent this today! 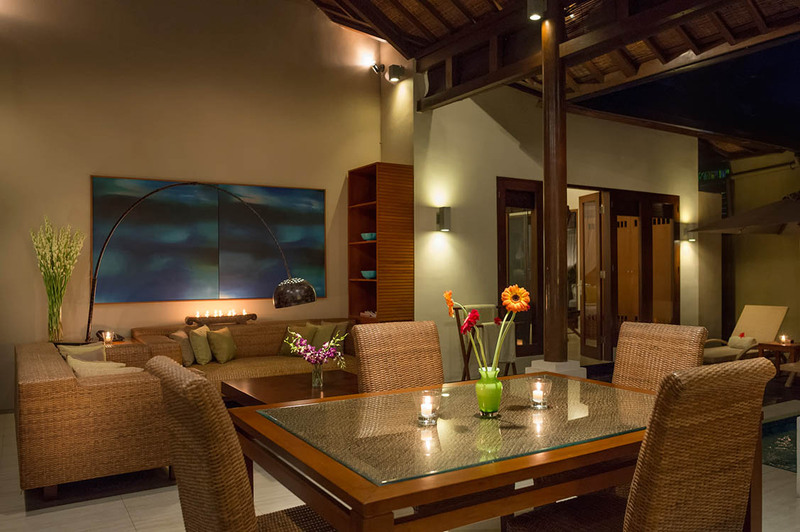 Lakshmi Villas are located right in the heart of Seminyak so getting to all those fabulous restaurants, bars and of course shops is very easy. 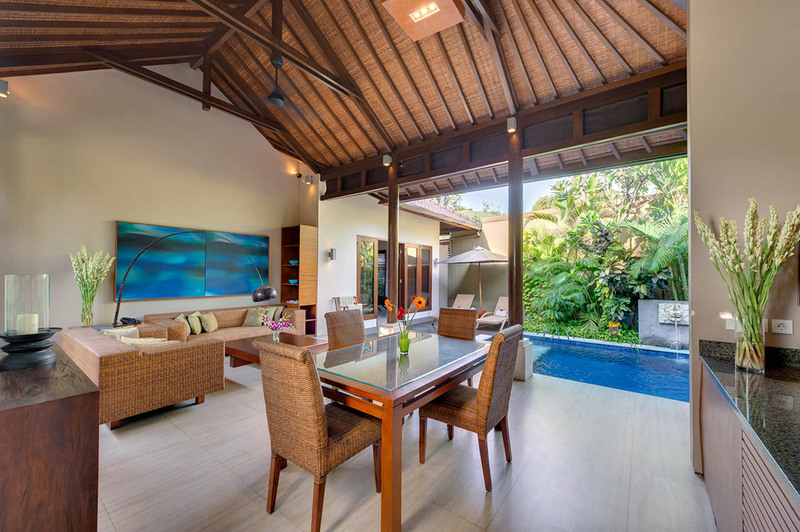 Villa Solo Lakshmi is a luxurious 1 bedroom Seminyak holiday villa holiday renatl, perfectly located in the prestigious Lakshmi private villa complex. 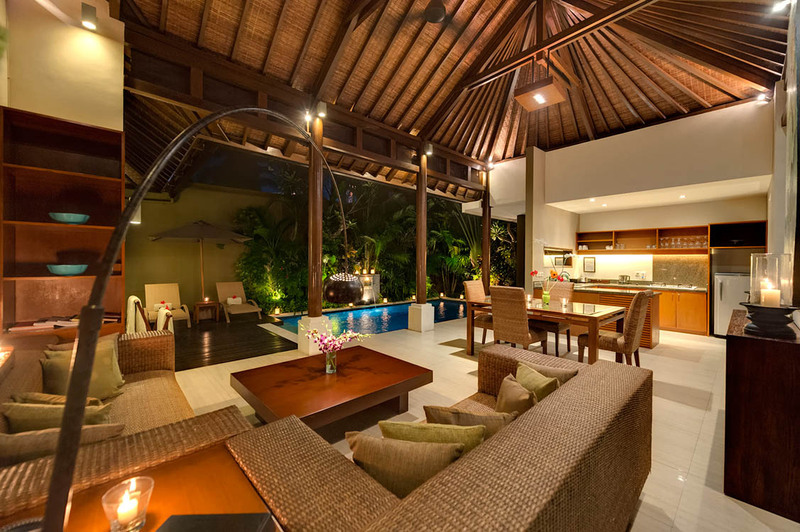 The villa offers guests private tropical living amidst the best of sophisticated furnishings and the best of amenities making it perfect for honeymooners and couples wanting to experience a memorable Bali getaway. 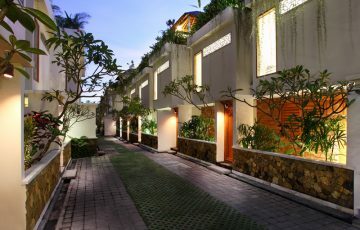 The villa complex is located right in the heart of Seminyak just off Jalan Laksmana in the upmarket Petitenget area. 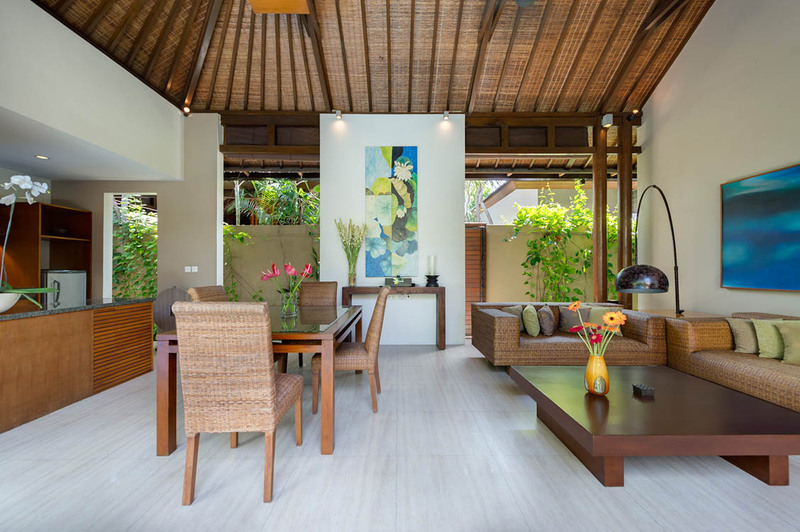 If your coming here on your honeymoon or as a couple just wanting to shop, eat out at fabulous restaurants and be in the heart of the vibrancy and action of Seminyak, this is the perfect villa. 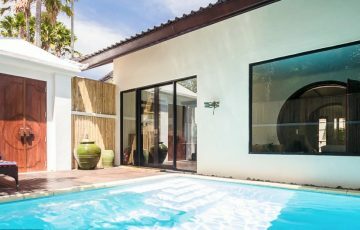 The villa is tucked behind double height walls so when your in the villas living areas or out around the pool you will experience total privacy. 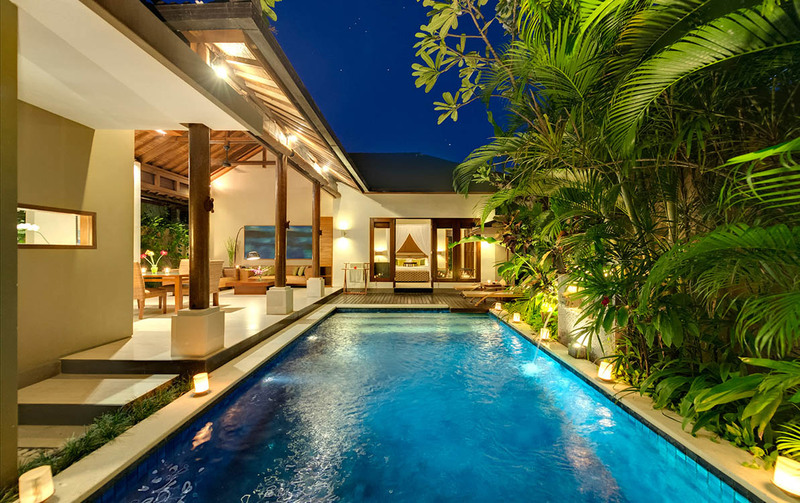 At one side of the sparkling pool is a lush tropical garden of mature palm trees, tropical flower and plants and a fragrant frangipani. 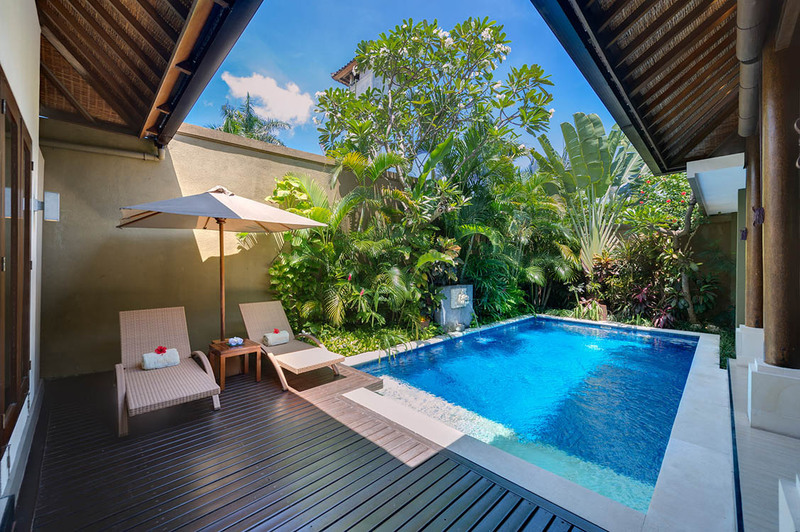 On the timber pool deck is a stylish two person rattan recliner ready for you to soak up the warm Bali sun. 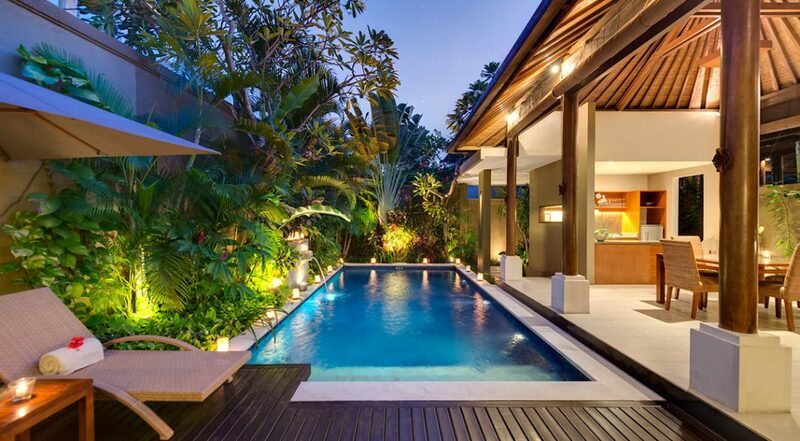 The living area runs down one side of the swimming pool and its open-air design allows you to enjoy the sounds of the pools calming water feature and exotic greenery. 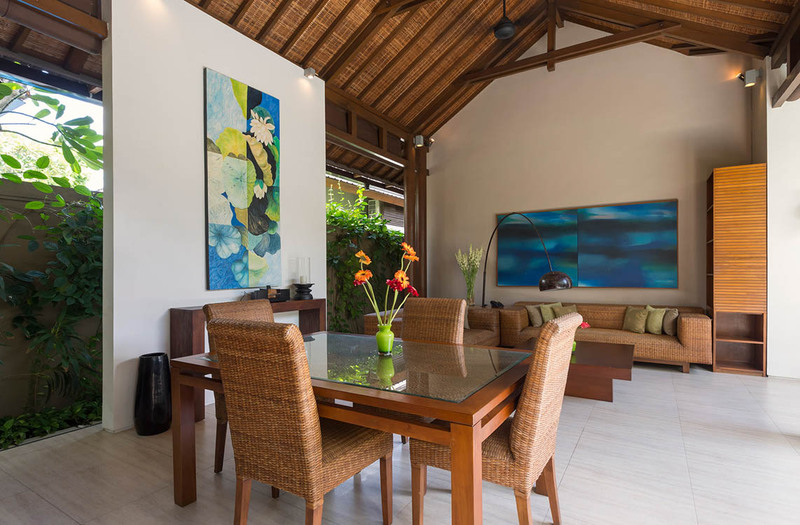 Under the soaring timber ceiling is a lounge, dining and kitchen area, all decorated in natural earthly tones and offering beautiful traditional design elements. 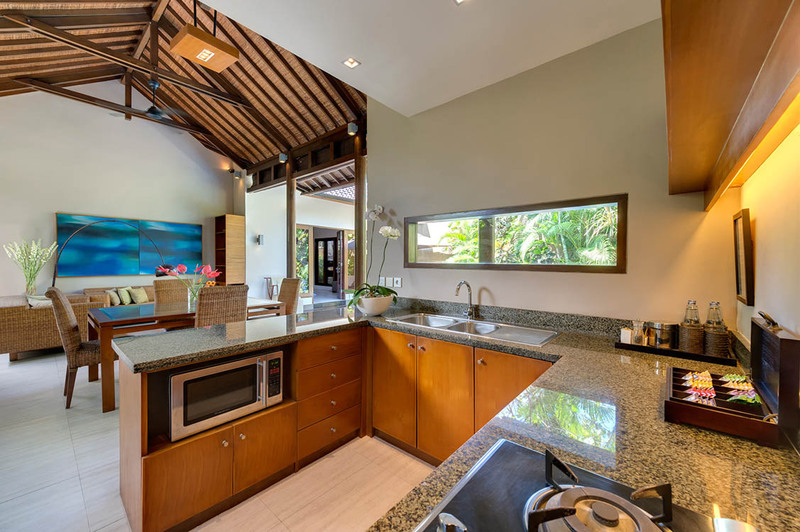 The chef will cook all your meals upon request but guests are welcome to do their own cooking. 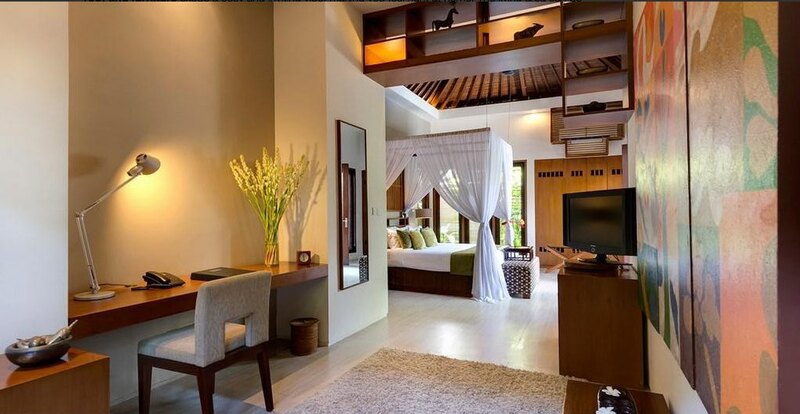 The bedroom has a romantic touch with the king sized bed wrapped in sheer white netting and big fluffy pillows with matching bed scarfs and vibrat wall art, evoking a sense of intimacy. There is a small sofa and a writing desk/work station area so you can keep up to date with the office. 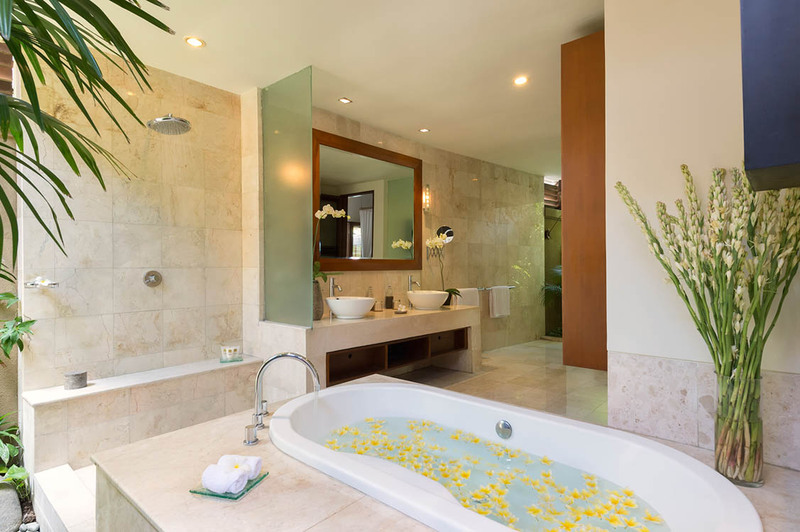 As you enter the en-suite the opulence is evident with beautiful marble surfaces and a huge jacuzzi tub perfect for two to bathe together and a rain shower. The entire villa complex is fully serviced so at any time you can pick up the phone and ask the staff to deliver food and beverages from the extensive menu or arrange transport or maybe even a restaurant booking or day tour around the island to some of the wonderful attractions. 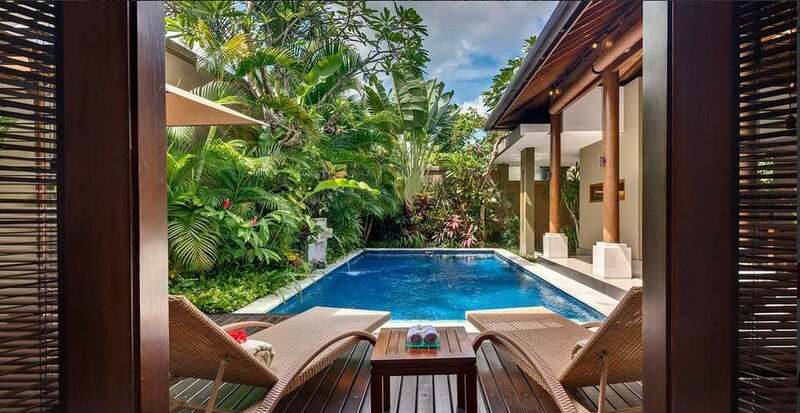 The villa is located just off Jalan Laksmana which is a continuation of Jalan Kaya Ayu and just a 5 min walk to Seminyak’s most famous beach club, Ku de ta. In the morning wake and walk over the road to the beach for a morning stroll from the famous La Luciola beach front restraunt and on the way back stop at Sea Circus for a coffee. 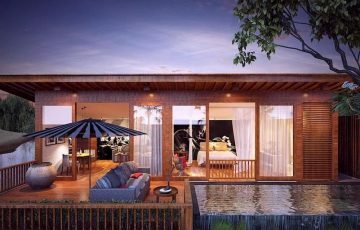 The Kiln is a brand new restaurant just a few hundred meters from the villa and some old icons such as Hotel Mexicola, Sisterfields and Ultimo along with Seminyak Square for all your grocery shopping are all near by. 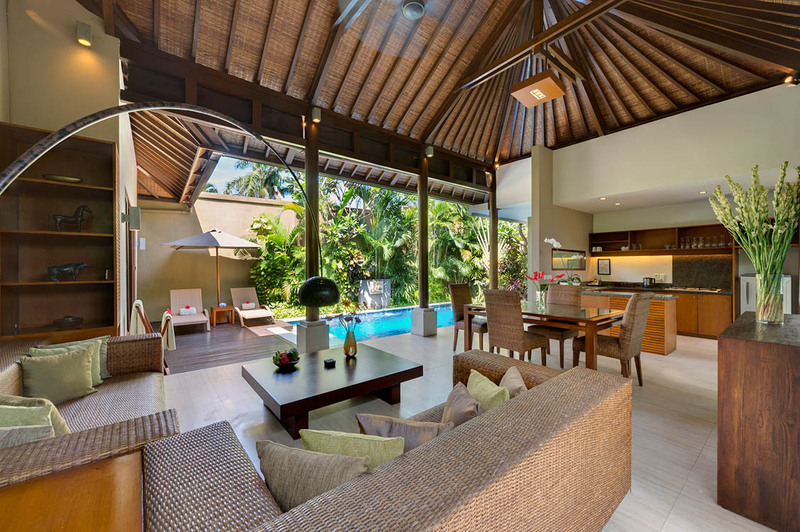 To view other 1 bedroom Bali villas or more Seminyak villas near Eat Street please browse this website or contact our reservation team. Fast and reliable wifi – great for uploading all those wonderful holiday pics to Facebook or keeping up with your work emails. 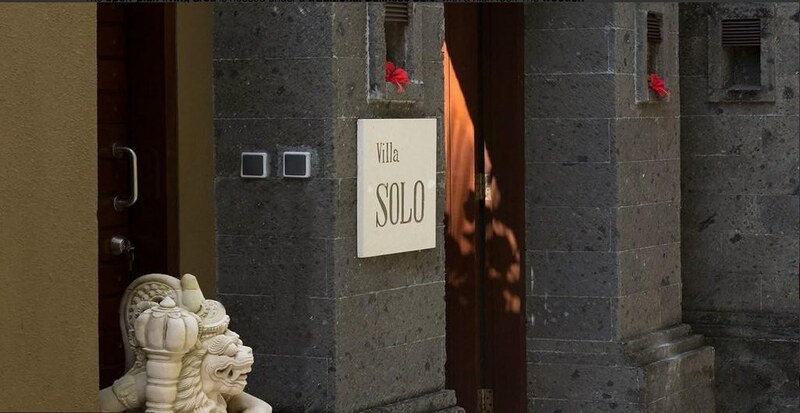 Staff : Villa manager ( who will be more than happy to organise anything for you), ;2 villa supervisors, 1 head chef, 1 cook, 5 butlers, security and gardener. 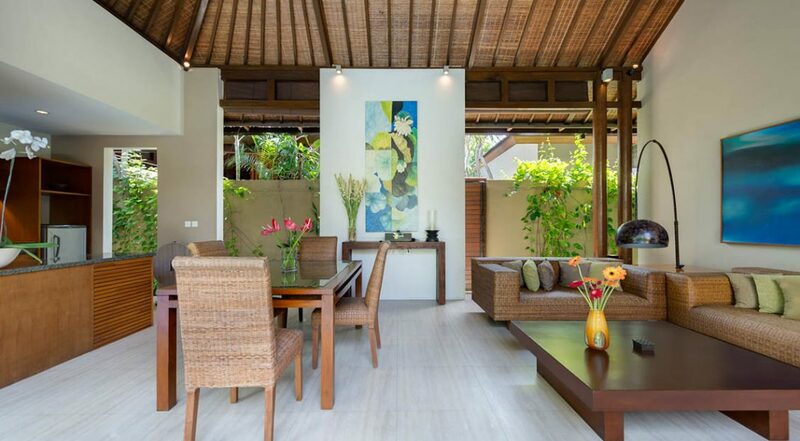 The villa suited us perfectly for our holiday needs because of it's fantastic location in Seminyak. The convenience, the facilities all came together to make tour stay here perfect. 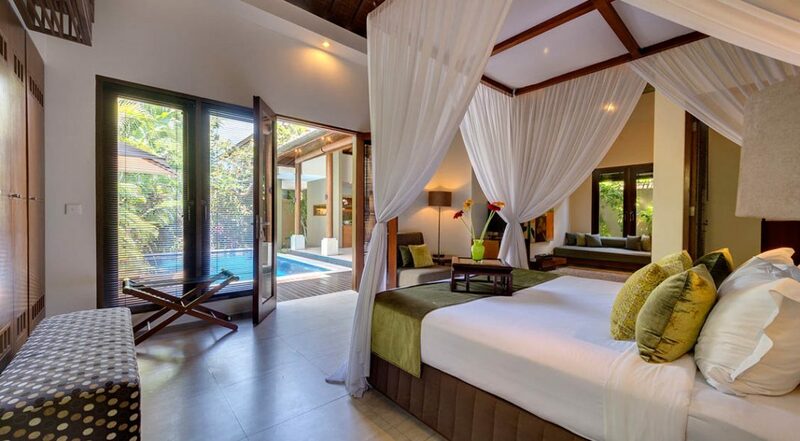 We both wanted privacy and a little bit of luxury on our week away together and found that Villa Lakshmi was absolutely perfect. 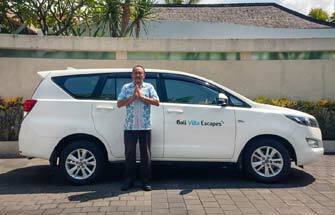 A huge thanks to Dewi and Ina at Bali Villa Escapes for putting this together for us at such short notice. We will be recommending your service as it was the very best! 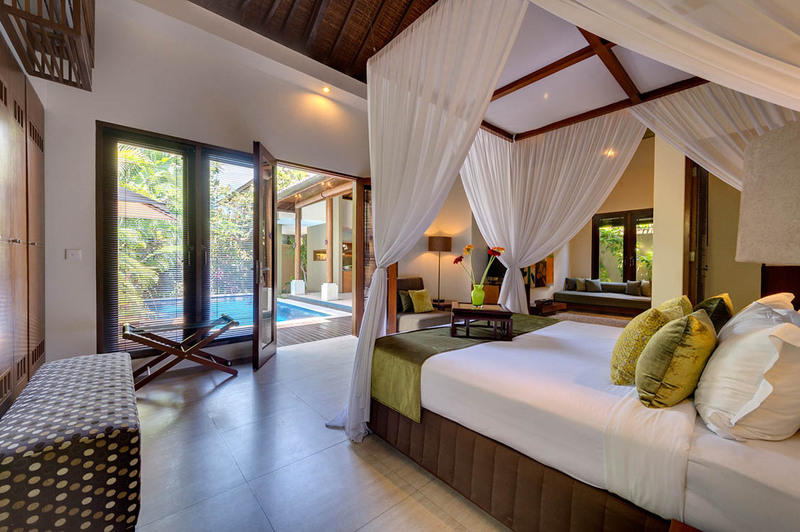 We decided to try staying in a villa on our honeymoon and as soon as we came across Villa Lakshmi online we fell in love with it straight away. The villa staff knew that we were coming here for our honeymoon and were there to greet us with a welcome drink and fruit basket. This was the perfect start to a unbelievably romantic 8 days of doing absolutely nothing except enjoying out own little private tropical oasis. 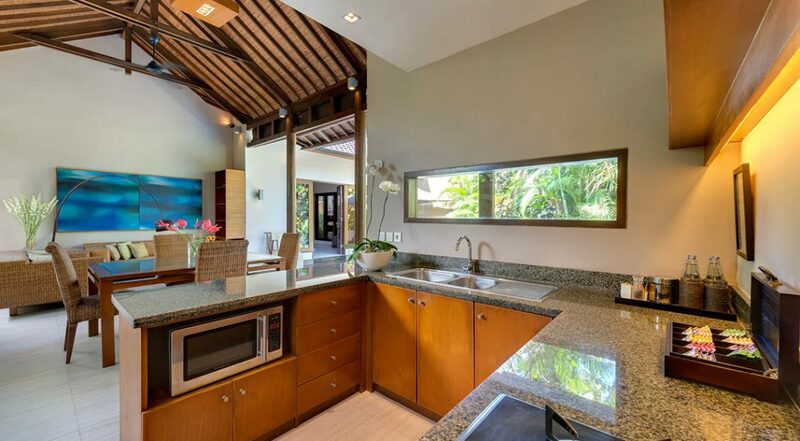 The villa was modern and everything about the place was meticulously maintained. 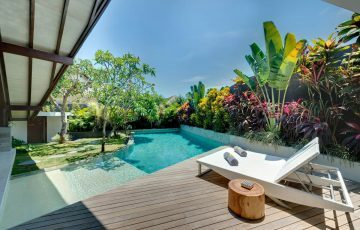 If your thinking about coming to Bali and want a lovely place to stay that's in a great location I would recommend Lakshmi very highly - it really does tick all the right boxes. 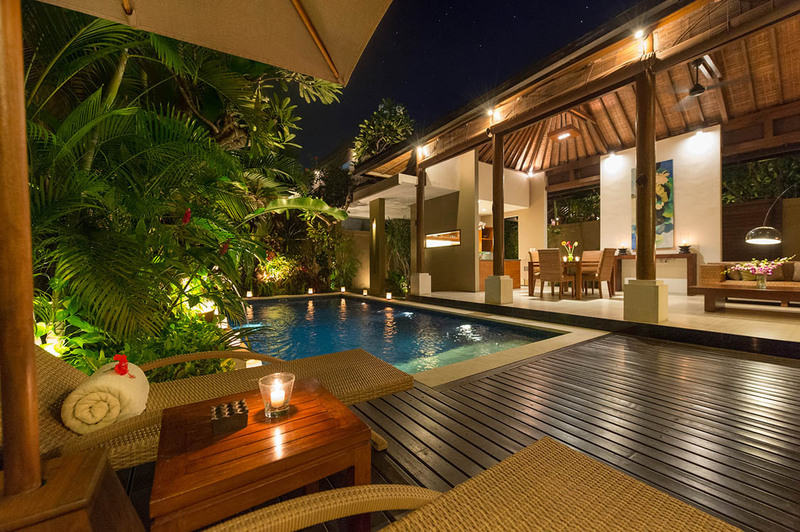 We have tried several different villas on various trips to Bali but would have today that this was the best by far. 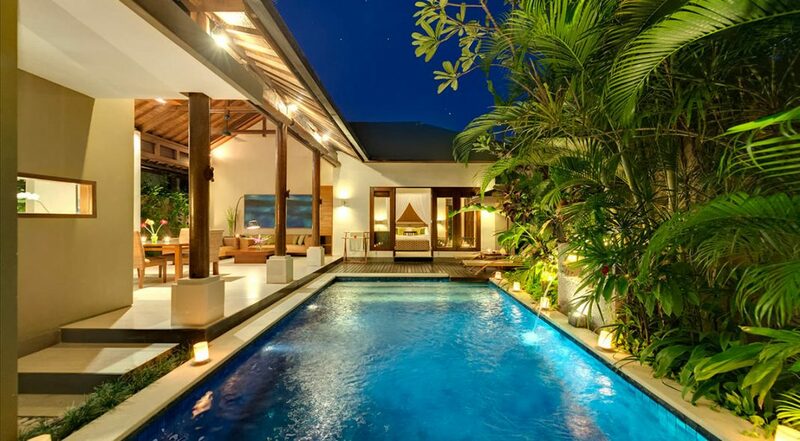 This is our second stay here and we love the location and the privacy of having our own pool. 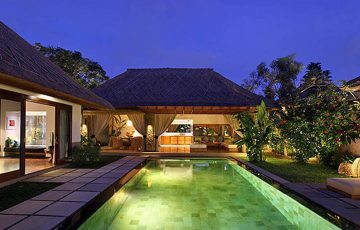 For a week away for the 2of you, this is one of the better villas in Seminyak. Like returning home after being away for a very long time!